Good price, good location. The apartments are really good value for money. Its fairly clean and really comfortable! The cleaner came to our room every day and changed towels/sheets as and when we requested! We knew there was no pool but there is plenty of choice... the hotel is situated only a few steps from cafe savannah so literally walk out the front door and your on the sea front. 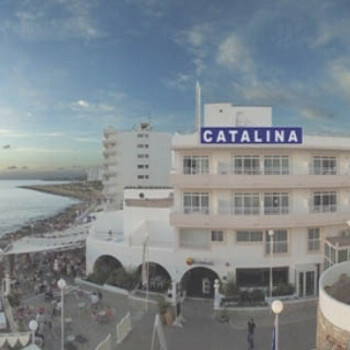 Strongly recommend hotel Catalina! Myself and 4 friends spent a week in the catalina apartment, where the apartment itself was situated was beautiful because of the ibiza sunset and because we where close to local shops, clubs and bars, but even still I would not stay there again, nor advise anyone to. On the first day of arriving we were warned that a number of thefts had taken place, and that the catalina along with the other local apartments are well known for it. The day before leaving, some person entered my apartment and stole my money and my mobile phone, a few days previous a couple had 3,000 euros stolen from them. 3 thefts took place within the week I stayed at the catalina. This person had no need to break in, as they had a key, a master key, which led myself and many others to believe it was a member of staff or that the staff played some role in the thefts. I reported the incident to reception, nothing was done, I asked about the numerous amount of cameras around the hotel, mainly the one outside my apartment door, and suprise suprise! they didnt work, no monitors attatched! (even though the couple who where stolen from before me was assured they would be fixed!) I asked for the police to be called, they arrived, didnt speak to myself but to the receptionist where the majority of the spanish conversation consisted of grinning at laughing at my exspense! Later on security for that evening arrived where my 18-30 rep made a point of proving the thief must of had a master key as only 2 keys are available for each apartment, I had one as did my friend who I shared the apartment with, all doors where locked an it was not possible to enter via the verander. The answer to all this was basically it was my own fault for leaving my stuff out an whoever did steal from me had to be english because all residents where english!, this was not the case as guests where very mixed, both english and spanish. I would also like to hightlight that before i was stolen from, a number of reports had been made that week about a spanish man, black hair and small entering apartments, then apologising to the occupier, as if he had gone into the wrong room! If a person has the ability and opportunity to enter someones apartment without permisssion and without geting caught, what is stopping this person from committing a much worse offence! This report is being written on the basis that we were there one week but had to come back early, our room was robbed on the second day, they moved us rooms that was robbed on the fifth day, using a key each time even the safe was opened, they took everything. The hotel staff were no help just saying we get at least three break ins a week. There were four or five in the five day period we were there, the hotel did nothing. The hotel is in a great location, is clean but if you value your property do not stay here, hotel wouldn't even phone the police we had to go to them ourselves. The hotel gave the impression they didn't care. If you take nothing else from this report just note that all these break ins were done with keys. We love Ibiza and have been before but this really tainted the place for us. We booked this hotel on a room only basis, but it had a fridge, cooking rings and everything you would find in a self catering property. The air conditioning was fantastic, you pay a deposit of 60 euros which you get back at the end of the holiday but you can't survive without it. The hotel was very clean, maids cleaned our rooms every day and changed bedding most days too. Room ok, clean. Towels only changed once week! Adequate enough for us girls to sleep and shower. Staff friendly, particularly night staff. Found male members of staff bit creepy?? Didn't have swimming pool though so had to use another hotels pool 3 minutes away. Close to beach and couple of bars, strip only ten minute walk away.